Summer months for many people include travel. I find that travel can present some challenges to maintaining my normal routines for prayer and Bible reading, but they are not insurmountable. Yesterday, I drove to our church camp to serve as a chaplain for a couple of days with our camp staff who are going through training. When I got to my room, the first thing I did was set up my devotional space. You can see it in the picture above. Something that is sacred or holy is something set apart for God. That little space is my sacred space for the next few days. It’s where I will take time set apart from the rest of my day to encounter God. In my devotional space there are several items I brought from home and my office. These things serve as mental anchors to my home routines and are visual triggers to keep me faithful to my spiritual disciplines. Here is what is in my space. 1) My devotional bible. 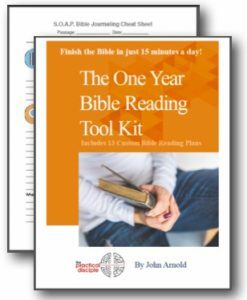 I use a Kay Arthur Inductive Study Bible for my devotional reading. It has no headings, footnotes or commentary. It’s basically raw text with wide margins for keeping notes. I do most of my reading from it because I like to first look at text and pray about it without being led by any other commentary. I use an ESV (English Standard Version) Study Bible, when I start moving into more research. 3) A blue mug full of colored pencils. I brought the mug and pencils from my office, as well. I annotate my devotional bible using colored pencils. I use colored pencils intentionally because they won’t bleed through the pages like highlighters or pens. To learn more about this practice read the post, What to write in your bible. 4) My journal. The black book in the picture is my journal. I journal in lots of ways. When I wrote my Novena, I intentionally wrote it on loose leaf paper, because I wanted to file it for easy reference next year. I find a bound journal more convenient when I am on the road. It’s smaller and I can readily pull it out when I am killing time in an airport or want to lie in bed and journal at the end of the day. 5) A little plastic turtle. You may not have noticed him in the picture. But in front of the blue mug is a little turtle. When I use to travel, I would get something from my kids to take with me as a tangible reminder of them and I would put it in my devotional space. For my son, I regularly brought a small plastic turtle I had bought for him while on vacation. For my daughter I carried a tiny clay vase with a dragon fly on it that I had bought her. This little turtle happened to be on my beside table when I was packing; so, I tossed him in as a reminder of my whole family. When I see him I remember my family in prayer while I am away from them. Your travel set-up can be very simple. May be it’s picking a certain chair in your room to be your prayer spot and leaving your bible or a devotional guide in it as a visual reminder. Even if you don’t pick a space, carrying an object with you that spiritually reminds you of God and home can be very helpful. I began this practice when I was a missionary in Alaska by simply carrying a pocket cross. You can read more about that in the post, Surround yourself with objects that teach. I suspect that experience was the root of my practice now of creating a sacred space while traveling. This practice has served me well and kept me true to my spiritual disciplines when traveling. I hope you will try it next time you travel. I am confident that you will find it is a blessing. I love this post, and I love the view out of that window. 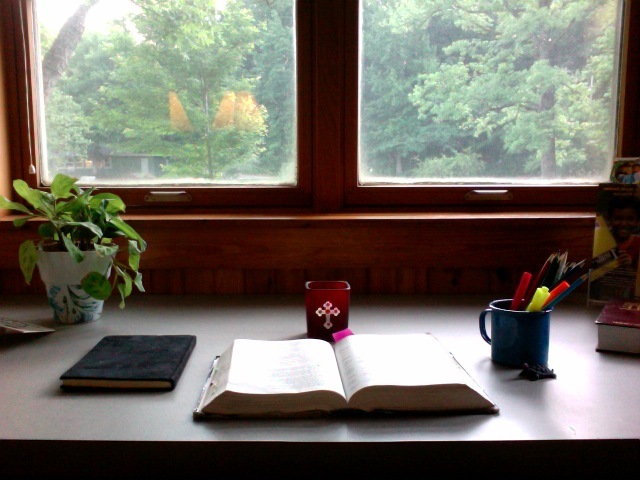 I am hoping to spend some “alone time” at Ferncliff this summer, writing and reflecting and reenergizing my relationship with the Lord. Somehow I missed your comment. I hope you have an amazing time at Ferncliff. I did. There is a fantastic group of counselors this year and I am anticipating campers having a great summer. Ferncliff is truly a blessed place. I thank God for the amazing ministry they do. Blessings on your time there.